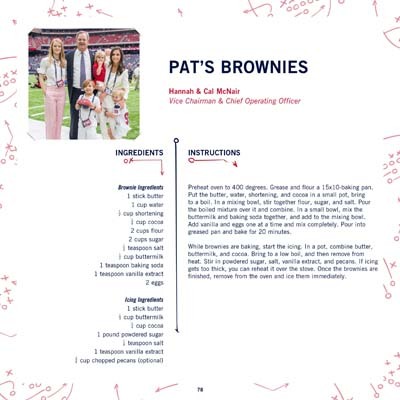 HOUSTON (KTRK) -- The wives of Texans players ans staff have created a cookbook to share the recipes that fuel the franchise. You will be able to by the book on the Texans' online shop. Hannah & Cal McNair are the Vice Chairman & Chief Operating Officer of the Texans respectively. They've shared their recipe for Pat's Brownies. Preheat oven to 400 degrees. Grease and flour a 15x10-baking pan. Put the butter, water, shortening, and cocoa in a small pot, bringto a boil. In a mixing bowl, stir together flour, sugar, and salt. Pourthe boiled mixture over it and combine. In a small bowl, mix thebuttermilk and baking soda together, and add to the mixing bowl. Add vanilla and eggs one at a time and mix completely. Pour intogreased pan and bake for 20 minutes. While brownies are baking, start the icing. In a pot, combine butter,buttermilk, and cocoa. Bring to a low boil, and then remove from heat. Stir in powdered sugar, salt, vanilla extract, and pecans. If icinggets too thick, you can reheat it over the stove. Once the brownies arefinished, remove from the oven and ice them immediately. 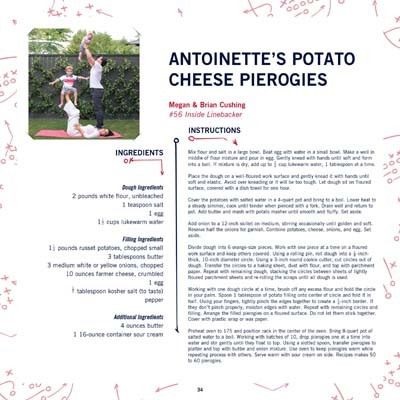 Megan & Brian Cushing have shared their recipe for Antoinette's Potato Cheese Pierogies. Mix flour and salt in a large bowl. Beat egg with water in a small bowl. Make a well in middle of flour mixture and pour in egg. Gently knead with hands until soft and form into a ball. If mixture is dry, add up to cup lukewarm water, 1 tablespoon at a time. Place the dough on a well-floured work surface and gently knead it with hands until soft and elastic. Avoid over kneading or it will be too tough. Let dough sit on floured surface, covered with a dish towel for one hour. Cover the potatoes with salted water in a 4-quart pot and bring to a boil. Lower heat to a steady simmer, cook until tender when pierced with a fork. Drain well and return to pot. Add butter and mash with potato masher until smooth and fluffy. Set aside. Divide dough into 6 orange-size pieces. Work with one piece at a time on a floured work surface and keep others covered. Using a rolling pin, roll dough into a -inchthick, 10-inch diameter circle. Using a 3-inch round cookie cutter, cut circles out of dough. Transfer the circles to a baking sheet, dust with flour, and top with parchment paper. Repeat with remaining dough, stacking the circles between sheets of lightly floured parchment sheets and re-rolling the scraps until all dough is used. they don't pinch properly, moisten edges with water. Repeat with remaining circles and filling. Arrange the filled pierogies on a floured surface. Do not let them stick together. Cover with plastic wrap or wax paper. Preheat oven to 175 and position rack in the center of the oven. Bring 8-quart pot of salted water to a boil. Working with batches of 10, drop pierogies one at a time into water and stir gently until they float to top. Using a slotted spoon, transfer pierogies to platter and top with butter and onion mixture. Use oven to keep pierogies warm while repeating process with others. Serve warm with sour cream on side. Recipes makes 50 to 60 pierogies. 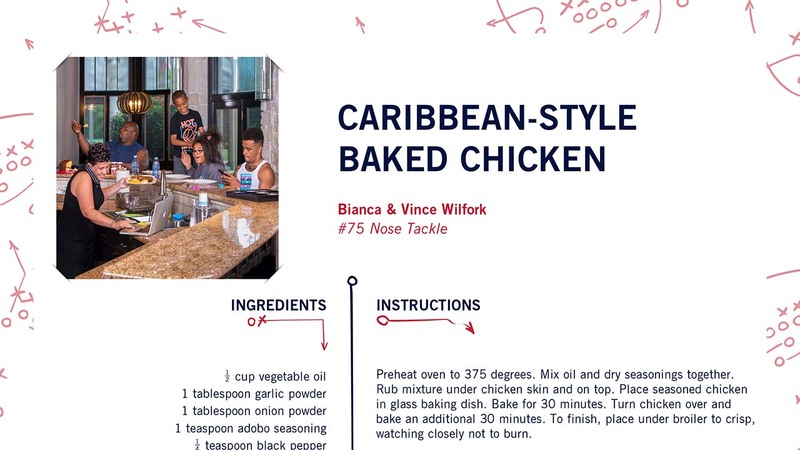 Bianca & Vince Wilfork have shared their recipe for Caribbean-Style Baked Chicken. Preheat oven to 375 degrees. Mix oil and dry seasonings together. Rub mixture under chicken skin and on top. Place seasoned chicken in glass baking dish. Bake for 30 minutes. Turn chicken over and bake an additional 30 minutes. To finish, place under broiler to crisp, watching closely not to burn. 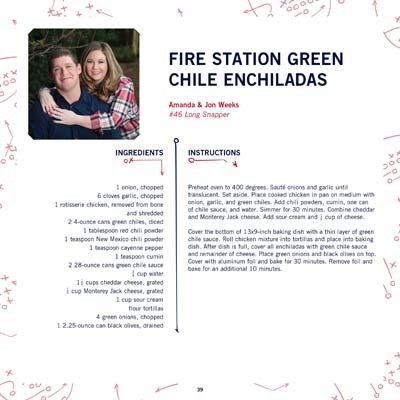 Amanda & Jon Weeks have shared their recipe for Fire Station Green Chile Enchiladas. and Monterey Jack cheese. Add sour cream and cup of cheese. and remainder of cheese. Place green onions and black olives on top. Cover with aluminum foil and bake for 30 minutes. Remove foil and bake for an additional 10 minutes. 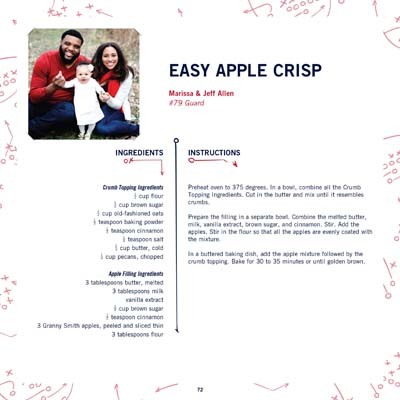 Marissa & Jeff Allen have shared their recipe for Easy Apple Crisp. apples. Stir in the flour so that all the apples are evenly coated with the mixture. In a buttered baking dish, add the apple mixture followed by the crumb topping. Bake for 30 to 35 minutes or until golden brown.